This week Cheryl Akle is joined by respected Australian journalist Kerry O’Brien to discuss his latest book Kerry O’Brien, A Memoir. 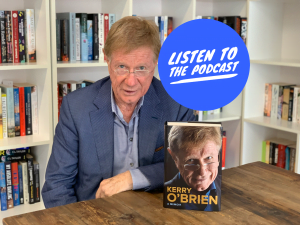 Together they discuss the highlights and challenges of Kerry’s career, and how he came to be a Walkley award-winning journalist. O’Brien has specialised in national politics for the ABC as well as the Seven and Ten television networks, and was a press secretary to Labor leader Gough Whitlam. He has honorary doctorates from the University of Queensland and the Queensland University of Technology.